What is disinfection? Disinfection is the process which reduces the number of microbes on a reusable medical device, however it does not necessarily destroy certain viruses and bacterial spores. Cleaning is an essential first step in the preparation of all reusable medical devices for disinfection. Devices may be disinfected by using either a washer- disinfector, low temperature steam, or by immersion in a liquid disinfectant. 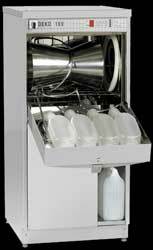 Using a washer- disinfector provides both cleaning and disinfection of the medical device. Thermal disinfection is the preferred method, although chemical disinfection may be necessary for heat sensitive devices. Disinfection is the process normally used to decontaminate medical devices that are not intentionally invasive. Though they may be in contact with mucous membranes, blood, body fluids and other potentially infectious material. (I.e. medium – high risk items). The aim is to prevent the risk of cross- contamination during the use of these medical devices. A further benefit of disinfection is maintenance of the “passive layer” of stainless steel. 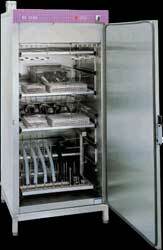 The passive layer is provided by the manufacturer of surgical stainless steel in order to prevent corrosion. Methodical, effective cleaning will maintain this passive layer. The importance of effective disinfection procedure is highlighted by the numerous cases of infectious occurrences that have taken place due to items being improperly decontaminated. In the cleaning of medical items, thermal disinfection is the preferred method, unless the item is heat sensitive, in such case a chemical disinfection may be necessary. Deko 2000E cabinet type single chamber washer disinfector for surgical instruments. 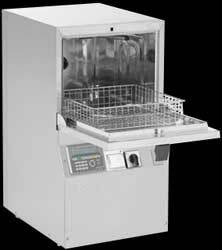 Franke Deko units are automatic micro- processor controlled washer- thermal disinfection units. Washer- thermal disinfectors are the preferred choice when cleaning and disinfecting medical items that have the ability to withstand strong water jets and repeated exposure to heated water of up to 93°C. Designed to offer reliability, outstanding cleaning and disinfection performance, the Deko washer- disinfection units offer a selection of programs suited to various washing and disinfection requirements, with adjustable wash water temperature dependent on the time to be disinfected. Built to endure continual everyday use, the Deko is recognized worldwide, with international performance requirements for cleaning efficiency and thermal disinfection being well exceeded.